Astronomers used the European Southern Observatory's Very Large Telescope Interferometer in Chile to observe the dust around the supermassive black hole at the center of the NGC 3783 galaxy, which lies tens of millions of light-years awayin the constellation Centaurus. The black hole, like many at the centers of galaxies, is gorging on a feast of mass that's fallen toward it from the surrounding area. As the dust falls in, it releases powerful radiation that can be spotted from across the universe. The dust inside the doughnut is hot, reaching temperatures of 1,300 to 1,800 degrees Fahrenheit (700 to 1,000 degrees Celsius), but the dust that's been blown away has cooled down, the astronomers reported. A paper detailing the findings was published today (June 20) in the Astrophysical Journal by lead author Sebastian Hönig of the University of California, Santa Barbara and Christian-Albrechts-Universität zu Kiel in Germany, and his colleagues. These observations suggest that the intense radiation produced when black holes feed on surrounding material also pushes some of this material outward. The discovery could lead to a "paradigm shift" in the understanding of how active supermassive black holes like this operate, scientists with the European Southern Observatory wrote in a statement. "This is the first time we’ve been able to combine detailed mid-infrared observations of the cool, room-temperature dust around an AGN with similarly detailed observations of the very hot dust," Hönig said in a statement. This image shows the region of sky around the active galaxy NGC 3783 in the southern constellation of Centaurus (The Centaur). The galaxy is the face-on spiral right at the center. Image released on June 20, 2013. 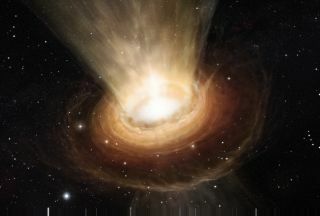 Astronomers hope to use this new knowledge to piece together a fuller picture of how black holes evolve within galaxies. A new instrument being developed for the Very Large Telescope Interferometer called Matisse should help scientists gather even more detailed observations of supermassive black holes. The Very Large Telescope Interferometer combines light from four separate telescopes to create extremely detailed amalgam observations. "I am now really looking forward to Matisse, which will allow us to combine all four VLT Unit Telescopes at once and observe simultaneously in the near- and mid-infrared — giving us much more detailed data," Hönig said.